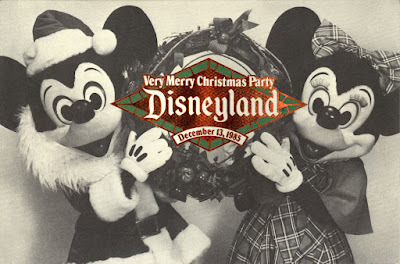 It’s time for a Very Merry Christmas Party at Disneyland, December 13, 1985. This in-park flyer is printed on thick textured bond paper. I’m thinking this was a cast party, it seems too nice for us regular folks. Nice holiday entertainment lineup, although I’m not sure how “Krash” fits in. 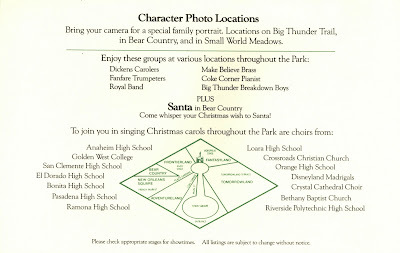 Bring your camera for a special family portrait with the Characters, where is/was “Small World Meadows”? 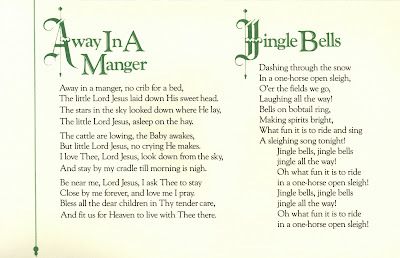 Check out all those choirs singing Christmas carols throughout the park. 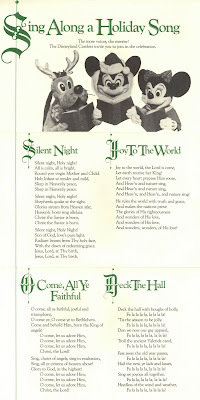 The Disneyland Carolers invite you to join in the celebration. 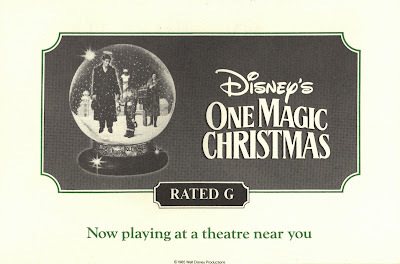 Don’t miss Disney’s “One Magic Christmas” starring Mary Steenburgen, ok, I’ve missed it for 24 years, in fact, I’ve never heard of it! 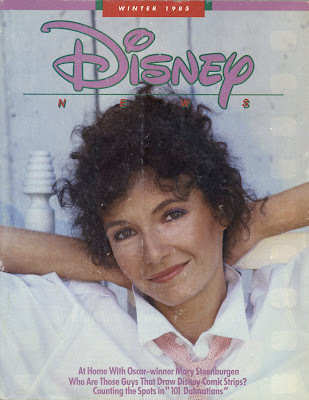 Looks like Mary Steenburgen graces the cover of the Winter 1985 edition of the Disney News. The Disney News had undergone a format change on the prior issue. The magazine is now more Glossy, more Zing, more pages but apparently pretty much the same content. I agree with reader “Dan” who wants more Disneyland articles. Caption EO looks to be a reality – is history repeating itself? 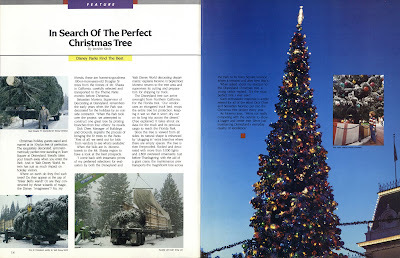 Back when Disneyland had a real tree. Did I mention they use fake trees now? “Frame Worthy” page in the center of the magazine. Do you suppose some folks actually framed these? 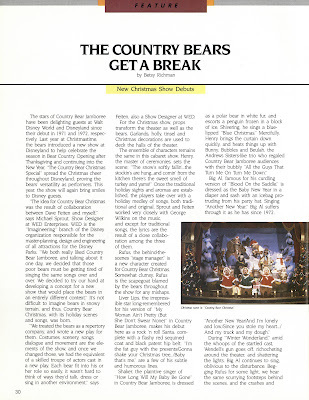 Nice two page article about the Country Bears new Christmas Show… Can you imagine the PR Disney could squeeze from this show if they still had it? 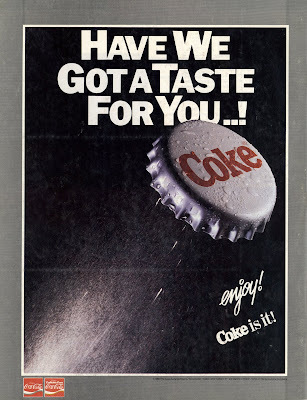 “Have we got taste for you” That taste would be the New Coke, which was either a colossal failure or marketing genius, depends how you look at it (link). Small World Meadows: Ask over at Disneyland Nomenclature about this. I remember the term was in vogue for only a short time and then disappeared. I think it referred to the formerly open spaces to the west of Small World after the Railroad tracks were pushed north. Mostly taken up by Videopolis. I figure that you can't really tell if the Christmas tree is real or fake anyway... it's so covered with stuff! Even the real ones were augmented with nailed-on branches, and then they were painted green (seriously!). I wonder how "green" an artificial tree really is. Yes, you don't cut down a real tree every year, but think of all the plastics and stuff used on the phony! Yep, the Small World Meadow area was the grassy spot to the west of Small World prior to Videopolis being built, but the map shows Videopolis alreday being there so what's the deal....were they calling some other area by that same name now? I still wish they had just expanded Fantasyland into that area and connected it with another new land in the Big Thunder Ranch/Hunchback arena area. That was what they were originally going to do. 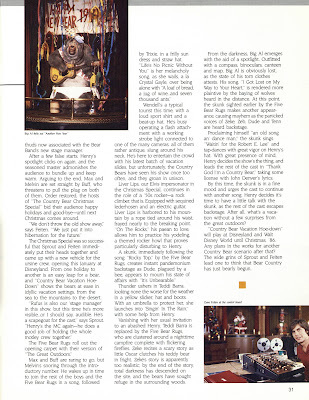 Then perhaps the Pooh ride could have gone back there and we would still have Country Bear Jamboree! 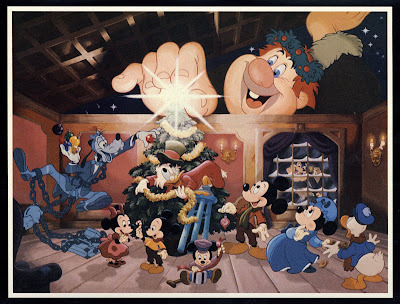 "Come a caroling with Mickey! You'll receive a beautiful sing-alongbook so you can join in with your favorite Disney characters! "Light up the night. The Disneyland Tree Lighting Ceremony touches off the excitement of an unforgettable evening. 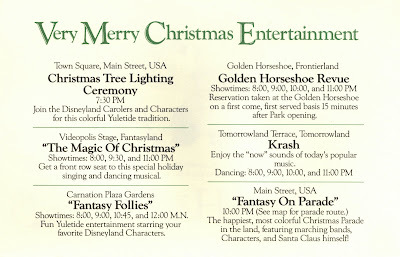 "Fantasy On Parade has become a Disneyland Christmas Classic. "'Magic of Christmas' Stage Show brings the magic of the season to life. "Country Bear Christmas Special is a hilarious holiday hoedown. "Christmas Follies is a stage show filled with the holiday spirit--Disneyland style. "Capture the Moment with a family photo taken with your favorite Disney pals. "Christmas Gifts for Everyone! Children 3-12 receive a fun-filled Disneyland Christmas Kit with games, puzzles and presents. All adults receive a beautiful Mickey Mouse Christmas tree ornament. "Free parking * Unlimited Use of Disneyland Attractions (Except Arcades)." 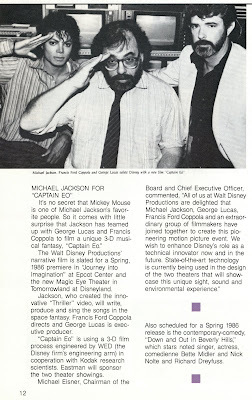 I haven't used too many sources from the 1980s yet (when I think "Small World Meadows" was used). I would have thought it went away when Videopolis opened. I'll keep the term in mind in case I come across anything more.